PRAGUE, 17 December 2015 – Emirates today announced that it will start flying its iconic A380 to Prague as of 1 May 2016, becoming the first and only operator of the world’s largest passenger aircraft in Czech Republic. Representing a 44% capacity increase for the route, which is currently operated by a Boeing 777-300ER, the deployment of the A380 to Prague demonstrates Emirates’ commitment to Czech Republic. Emirates’ daily service to Prague helps increase the city’s connectivity by allowing business and leisure travellers to fly directly to Dubai as well as to other exciting destinations like Thailand, Taiwan, China and Australia. The Emirates A380 on the Prague route will accommodate 519 passengers in a three-class configuration, with 429 spacious Economy Class seats on the main deck and 76 fully flat-bed mini-pods in Business Class as well as 14 First Class Private Suites on the upper deck. It also offers access to the world’s only onboard Shower Spas for First Class passengers and to the iconic Onboard Lounge, where First Class and Business Class passengers can socialize at 40,000 feet. While onboard, passengers in all cabin classes can enjoy Emirates’ renowned service provided by a multilingual crew representing more than 130 nationalities, savour gourmet cuisine and an award-winning inflight entertainment system, ice Digital Widescreen, which offers more than 2,100 channels of films, TV programmes, music and podcasts. Passengers traveling on the A380 easily stay connected to family, friends and colleagues with a wide range of communications options including free onboard Wi-Fi. The Emirates experience begins with a complimentary chauffeur-drive to and from the airport for Business Class and First Class passengers and with access to Emirates’ 38 exclusive airport lounges worldwide. As with all Emirates flights, passengers benefit from a generous baggage allowance of 30kg in Economy Class, 40kg in Business Class and 50kg in First Class. Currently, Emirates operates 71 A380’s around the globe, and its order for 69 additional models makes Emirates the largest operator of this aircraft in the world. 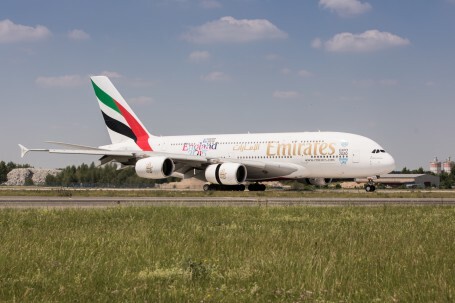 Emirates will also be the first and only carrier to regularly service a route with an Airbus A380 in the Czech Republic. Emirates currently connects Czech passengers to over 145 destinations around the world via one convenient stop in Dubai. Beginning 1 May, 2016, the daily Emirates Prague-Dubai route, operating as EK 139, will depart Dubai at 0905hrs and arrive in Prague at 1330hrs. The return leg, operating as EK 140, will depart Prague at 1540hrs and arrive in Dubai at 2335hrs.